Private Cooking Classes are available across Adelaide. Contact Paris to discuss a customised cooking class. You'll learn to make a delicious gourmet Margarita pizza: vine ripened tomatoes with Italian herbs and fresh basil. 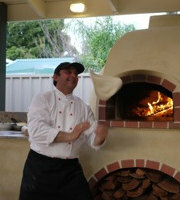 Please contact me if you'd like more information about Amore Woodfired Ovens Cooking Classes.